G2A, a digital gaming marketplace, now accepts Bitcoin through partnership with enterprise payment processor BitPay, stated a G2A press release. BitPay provides its payment processing services to over 60,000 businesses and organizations including big names like Microsoft and PayPal. 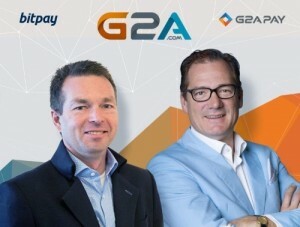 In the press release issued today, G2A said it’s the world’s fastest growing digital gaming marketplace, having invested more than 20 million euros in research and development over the past two years to ensure secure and guaranteed online initiatives, with 6 million unique users and more than 5 million transactions worldwide in 2014. The marketplace also said that to date, it has over 700,000 average monthly transactions in 2015. G2A further said in the press release that it is one of the leaders in digital gaming marketplaces and provides a safe and efficient way to make transactions for digital products like games, software activation licenses for Steam, Xbox Live cards, PSN codes and time-cards for online games. The news release said G2A.com serves more than 4,000,000 new customers per year recording more than 10 million transactions per year worldwide.